This chapter presents the first of two case studies. 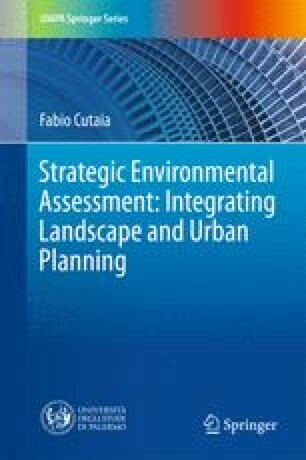 The European Directive about Strategic Environmental Assessment was introduced in as many ways as there are member states. The Italian Directive, like the Spanish and others, obligates, among other things, the consideration of effects of plans and programmes on the “landscape”. According to the definition provided by the European Landscape Convention, we cannot underestimate its significance simply concerning the ecological and environmental dynamics in general, because the landscape is also the result of human development. In this perspective, when we plan territorial transformations, we must consider the perception of the local community pertaining to their landscapes. This chapter, after the construction of the normative framework of the Veneto region, examines the case of the urban plan of Schio. The interest for this case is because its authors developed a perceptual approach in analysis of the landscape. The method implemented allows the translation of qualitative evaluations into quantitative data, as requested by Strategic Environmental Assessment and other environmental evaluation approaches generally.